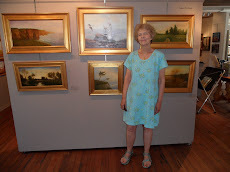 Both of my entered paintings were chosen to be in the Winter Juried Show Part 2. These entries are both watercolor and ink making them Mixed Media paintings. They are similar so I named them Winter Scene I and Winter Scene II. The Newburyport Art Association Winter Juried Show, Part One begins January 11, 2019 and continues to February 2, 2019. I will be showing a marsh scene for this show. You may recognize this marsh scene on the left as heading south on Route One toured on Ipswich. Crane Estate Annual Art Show & Sale. The Event will be held November 2-4 2018. The Crane Estate Art Show & Sale allows people to visit the Crane Castle and see a wonderful display of paintings on both floors. Friday November 2, 2018 there is a party from 7 - 10 PM. Please visit the Crane Estate information for the cost of a Friday night ticket. Susan Luca's paintings submitted to the Crane Estate Show and Sale 2018 are shown below. 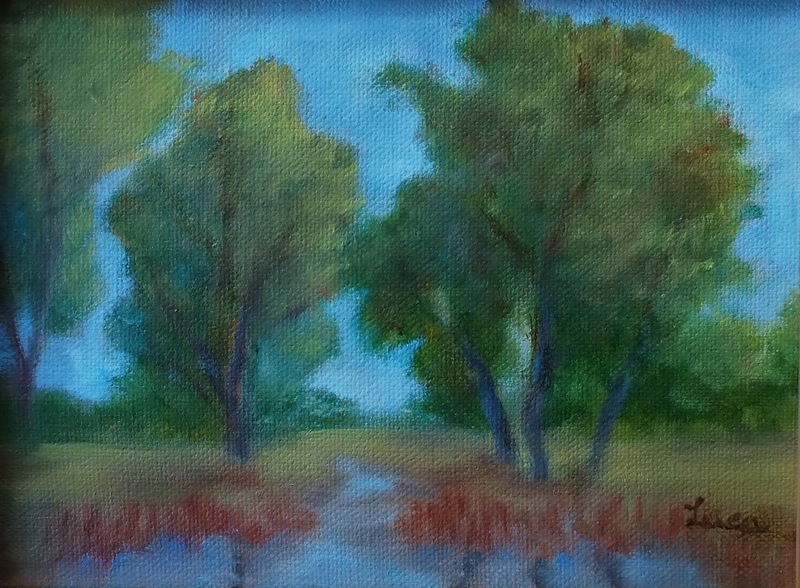 Crane Estate Autumn, oil, 18" x 24"
View Along the Road, oil, 6" x 8"
Marsh View, oil, 6" x 8"
July 31 - August 12, 2018 At the Newburyport Art Association 65 Water Street, Newburyport, MA. Come see some of my paintings. Watercolor Interest Group "Showing Off"
The Newburyport Art Association recently started the Watercolor Interest Group". It was an instant success and we've already shown the various watercolor paintings at the Newburyport Senior Center and twice at the rehab center on Low Street. The current focus is on a show at the Newburyport Art Association call "Showing Off" in the Laura Coombs Hills Gallery July 24-29th. The reception will be July 26 2018, 6-8pm. I'll have 2 framed paintings (7"x10" frame 14"x11") and 3 matted only paintings (7"x10" mat 14"x11"). 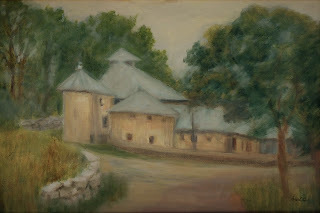 Three of my oil paintings have been chosen to show at Art In The Barn. Visit website ecga.org/artinthebarn for more information. Beautiful place to visit and fun art show. Saturday June 16 at the Newburyport Art Association Auction and Party. Artists choose their painting to submit in March and many of the paintings are shown at businesses in town before the auction. I will be saving this painting for the auction. Just found out that my painting has been accepted into the Newburyport Art Association Winter Juried Show Part One, January 12 - February 3, 2018. Good way to start the new year. This painting would look very nice over a fireplace mantle. The show reception is scheduled for Saturday January 13, 7-9 PM. The Crane Estate Show is free to the Public Saturday & Sunday November 4-5 10am-4pm. It takes place in the Crane Castle on Castle Hill 290 Argilla Road, Ipswich. The show has wonderful works of art for sale in the castle so visitors get to see the beautiful rooms of Crane Estate. Here are my entries which will be on display. The smaller paintings will be on the second floor. Hope you enjoy the show! 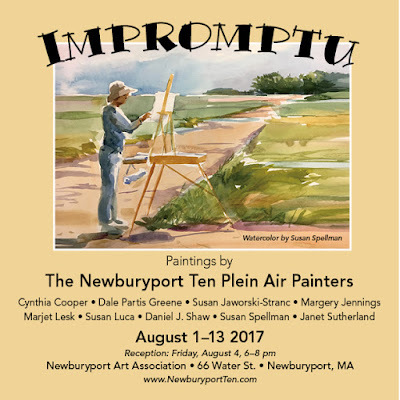 The Newburyport Art Association sponsors two Fall Member Juried Shows. Fall Juried Show Part One from October 13-28, 2017 includes Digital Art, Drawing, Oil, Printmaking, Sculpture and Watercolor. I was informed today that both of my oil paintings were accepted into this show. Please visit the NAA for more details about visiting this show. 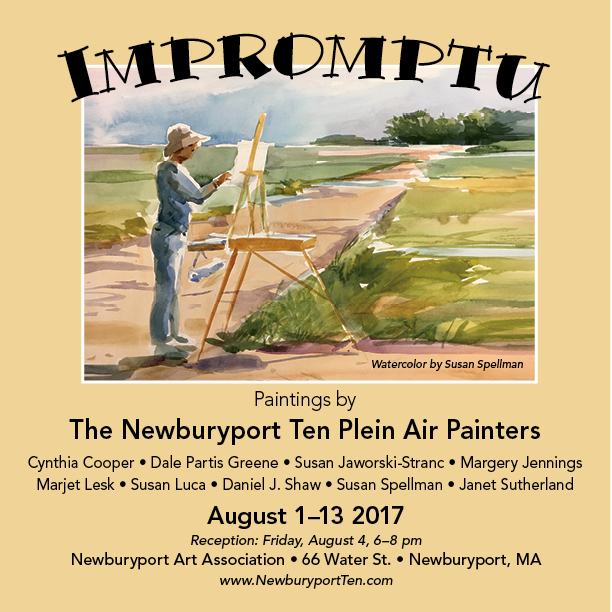 Please come to see the paintings at the Newburyport Art Association 8/01/17 to 8/13/17 ! Watercolor painting by Susan Spellman. That's me as her model.